Ji-Sung Park isn’t a gifted footballer, but not for want of trying. Manchester United’s first Korean player is also Manchester United’s most endearing try-hard, their most blatant commercial maneuver and their most bizarre success story. When Rafa Benitez bought Dirk Kuyt and then immediately shifted him to an unnatural wing position, he probably had Ji-Sung Park in mind, which – considering that United and Liverpool are about as friendly as Olof Mellberg at the full moon – says a lot, and not just about capitalism. As you may have heard, the Ji-Sung Park Old Trafford fantasy, packaged and sold to millions of hopeful Seoul teenagers, is about to come screeching back to earth in a burst of super-charged dream-busting so powerful that it will probably blow the roof off Loftus Road, a quaint stadium in the middle of a quiet London neighborhood terrifically unsuited for this type of cosmic event. For legions of gullible Korean teenagers, Park’s transfer to QPR will probably be heartbreaking, maybe life-changing, and certainly soul-destroying. United scarves will burn tonight. For a man whose right to play football for Manchester United has been questioned constantly by a cohort of cynical newspapermen convinced that he was bought more for his marketability than for his playing ability, seven years at arguably England’s most successful club, but indisputably England’s most successful club over those seven years, represents a fair old career. Compared to the career of United’s other notable “commercial” recruit, Chinese striker Dong Fangzhou, Park’s tenure looks even more impressive. Park broke into the United first team through sheer persistence. So what if he couldn’t keep up with Nani’s juggling, or was blinded by Ronaldo’s stepovers? No one expected Park to be skillful. Occasionally, he’d score a great goal, and, as one, the entire Stretford End would gasp, gawk and stare suspiciously: He’s not supposed to do that, is he? Park was always so predictable in his mundane effectiveness that every time he did something extraordinary, fans’ initial excitement dissipated in confusion. Watching Park dribble past three players wasn’t just surprising, — it felt wrong, almost as if this particular professional footballer, the captain of his country and a Champions League winner, couldn’t copy his talented peers without breaking some law of footballing physics. He just ran. And ran. And ran. Although skill, technique and intelligence are by far football’s most potent weapons, fans and coaches still love to glorify “the workhorse.” Over the years, Manchester United supporters have enjoyed their fair share of star talent – Best, Charlton, Cantona, Beckham, Ronaldo, Rooney – but they still keep a special place in their hearts for honest workers like Park. According to MUTV-exclusive-all-access-meet-the-players lore, Park has forged an unlikely friendship with United defender and World Cup mutiny leader Patrice Evra. They’re inseparable, or so teammates say. So not only did Park succeed in establishing himself as a fan favorite, but he also buddied up with the most rebellious member of United’s squad, thereby nullifying a destructive personality. It’s hard not to see Park as a necessary cog in Ferguson’s grand football machine. Manchester United recently unveiled their kit for the 2012/13 Premier League season. The jersey features a plaid, “textile” design, which “echoes Manchester’s industrial past” — you know, it’ll resonate with the common folk. All that We Are The Real Manchester rhetoric was supposed to be City’s thing. But now that their stadium is named after an Arab airline, their best player is a Spanish World Cup winner, and their transfer expenditures far exceed United’s, the Real Manchester tag no longer fits. 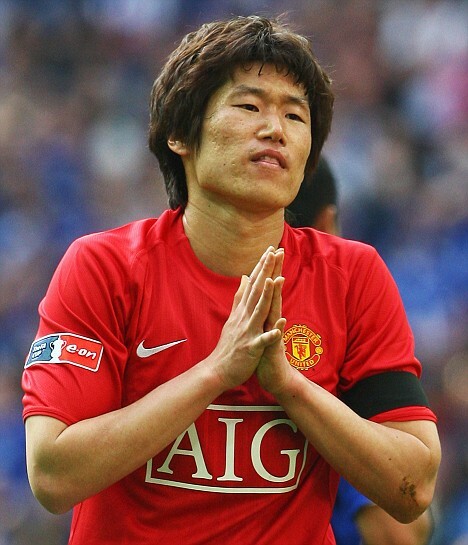 But if there’s one player who embodies those down-to-earth, no-frills values, it’s Ji-Sung Park. According to some, he’s a walking, talking, football-playing advertisement, the guy who sells shirts in Asia. How apt, then, that his industrial style of play should be the essence of United’s latest commercial stunt. Obviously, it takes more than passion and stamina to play for Manchester United. This is professional football, however amateur QPR looked last season. But Ji-Sung Park won’t be remembered for his underrated finishing, positional sense or physical strength. United fans will never forget that Park always ran. That memory will outlast his time at QPR. And if the Old Trafford crowd squints really, really hard, maybe they’ll see his ghostly silhouette, still running, still working for the cause.